The Impact Basic Varipole Support System is comprised of a pair of Varipoles, 2 super clamps that accept the included U-Hooks and a crossbar that will hold seamless rolls up to 107". 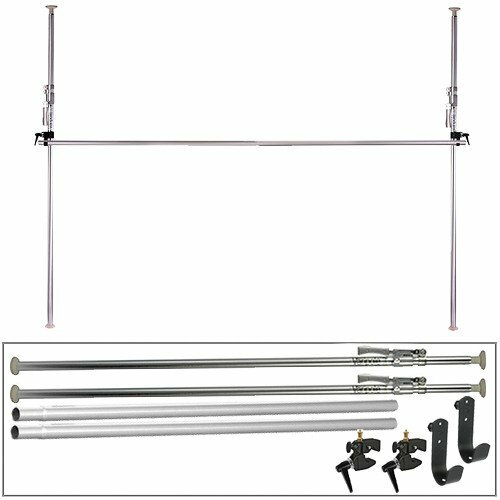 The Varipole easily and quickly mounts between floor and ceiling providing stable support for backdrops, reflectors, lights and grip accessories. With a strong tension mechanism and locking system, the Varipole is secured by its own force of pressure between solid walls or floors and ceilings. Adjustable between 6'11" (2.1 m) and 12'1" (3.7 m), the Deluxe Varipole is capable of turning most rooms into a photo studio without damage to walls or ceilings. Simply snap the U-Hooks into the Super Clamps to provide a cradle for the crossbar, add optional seamless paper and shoot. Floor to Ceiling Support System * Holds Seamless Rolls up to 107"